The weather is getting a little warmer, and many people are beginning to spend more time outdoors doing some of their favorite activities. 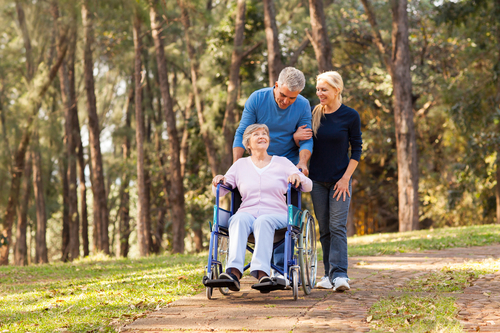 But if you have limited mobility, you might feel confined to your home, unable to get out and enjoy the springtime weather. That doesn’t have to be the case. Here are a few outdoor activities that those with restricted mobility can still enjoy. Walk with a friend. Ask a neighbor, family member, or friend to walk with you on a regular basis. They can lend you a supportive arm throughout your walk. Use a walker. Whether it’s wheeled or not, these can help you to walk on your own. Use a cane. If you don’t feel like you need the full support of a walker, a cane can help to give you a little more balance and stability while you’re out on your stroll. Ride on a scooter. If you’re not able to walk any significant distance at all, just ride on a scooter around your neighborhood. This way, you can still get out of the house and enjoy the spring sunshine. If it’s been a while since you’ve done any walking, be sure to start out with short distance. Even just walking to the end of your street is a great start, regardless of how much assistance you need to do it. Water-based activities are great for those with limited mobility. Being in the water reduces your weight, taking strain off of your muscles, bones, and ligaments. Plus, it significantly reduces the risk of injury from a trip or fall. If you aren’t lucky enough to have a pool on your own property, look into community pools and rec centers. Many of these locations have pools available for use, and may even have an outdoor pool if you want to spend a little time out in the sun. Whether you’re swimming laps or just lounging and enjoying the water and sunshine, this is a great outdoor activity for people of all fitness and mobility levels. If you’re a bit unstable on your feet, but have a strong upper body, paddling sports are a great outdoor activity that you can enjoy. Kayaking, canoeing, and other such sports allow you to sit comfortably and use your upper body to move independently through the water. This can be done in the ocean, lakes, streams, and rivers. Exactly where you paddle will depend largely on your experience and capabilities. If you’re new to paddling sports, then it’s best to stick to calmer waters. It’s also a good idea to do these kinds of sports with a partner for safety purposes. Camping is a wonderful way to enjoy the outdoors, but if your mobility is limited, you might feel this activity isn’t really available to you. However, accessible camping sites are becoming more and more common, so even those who are confined to a wheelchair can enjoy time camping with friends and family, and enjoying nature. If you’re interested in this kind of activity, look for camping sites that are accessible based on your mobility level to ensure you won’t have any problems around the campsite. You can also look into activities in the area that suit your physical capabilities. Some camping areas even have wheelchair-accessible hiking trails nearby, so you and your fellow campers can further explore what nature has to offer. If you’re planning on participating in any outdoor activities, and you require the assistance of a mobility device, be sure to adapt your current device or find one that is suitable for your planned activity. All-terrain wheelchairs and scooters are generally quite easy to find and make it much easier to move over rough terrain and small obstacles while you’re outside. Be sure to stop by one of our many locations to see what mobility devices we can offer you, so that you can get out and enjoy the beauty of Texas in the springtime.